With overcrowded flights comes overcrowded gates, and United Airlines is working to alleviate that issue for its customers. 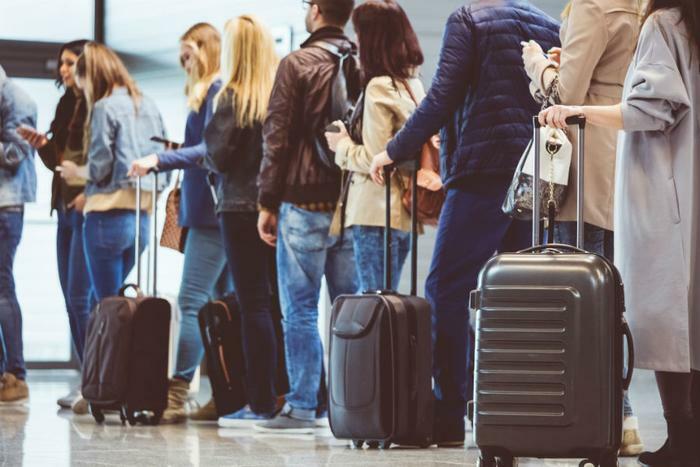 Recently, customers have been vocal about the issues at the boarding gates, complaining to United that arriving passengers were greeted at the gate by masses of travelers, while others are spilling out into neighboring hallways. This week, United started boarding passengers with a new system, as the company works to keep crowds under control and ensure that flights take off on-time. Where there were once five boarding lines, United has reduced that down to just two color-coded lines -- lane one is the blue lane and lane two is the green lane. The airline is urging travelers to wait until their boarding group -- one through five -- is called before making their way to the lanes. Additionally, United has altered its pre-boarding routine to smooth things along. Now, United’s Premier 1K and Global Services frequent flyers will join military personnel, passengers with disabilities, and passengers with young children in pre-boarding. This group will board in lane one. First-class, business-class, Platinum, and Gold-level frequent flyers will board in group one -- also through lane one. At this time, those in boarding group two will be permitted to line up in lane two. Once group one has had their boarding passes scanned, group two will begin the boarding process. Silver-level frequent flyers, United credit card holders, and those who have purchased priority access or boarding privileges will be assigned to group two. At this time, groups three through five will not be permitted to enter the boarding area until board group two has left the line. Groups three through five will then be called -- in order -- and will board through lane two. Most Basic Economy passengers will be in boarding group five. To help with travelers crowding the gate, United is now alerting passengers when boarding begins with a notification on their phones. All travelers will receive the alert once the first boarding pass for that particular flight has been scanned. According to Walter, some flights had passengers congregating in the boarding area for over an hour. She also said that travelers are drawn to lines, so what starts out small can grow to quite a crowd rather quickly. “It’s like a magnet,” she said. United spent the last year testing this new boarding method on over 12,000 flights around the world, gauging customer feedback along the way. The new boarding system now makes United more similar to both American Airlines and Delta, whereas Southwest’s unassigned seating setup allows passengers to board based on when they check-in or their loyalty status level.